Massaging is one of the most important processes in the preparation of processed meat products to attain ideal color, appearance and absorption of additives. Danfotech tumbler massagers are designed to ensure efficient, reliable, economical, and flexible production. 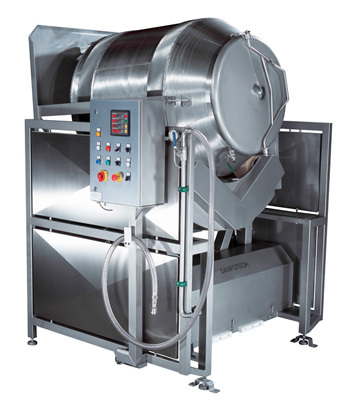 The drum can maintain up to 95% vacuum and can be connected to continuous vacuum if required. The tumbler consists of a machine frame with four gearmotor driven supporting wheels holding the drum. The friction between the massaging drum and wheels turns the drum. Additional drums can increase the overall capacity, making it an economical means of expanding production capabilities gradually with a minor investment. The massage drums can be removed from the unit and placed in cooling rooms with the products still under vacuum. Wheels on the massage drums allow them to be used as storage or transport containers, with meat to be stored under vacuum until it is emptied. Avoiding contamination from the surroundings improves product quality. The massage drum pivots from vertical filling position to the horizontal massage position. 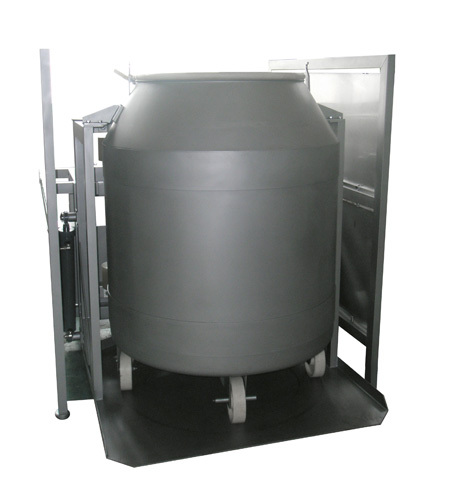 After massaging, the drum returns to vertical position it can be transported to the cooling room for maturing or to a filling station. The built-in hydraulic system swivels the massage drum. A swing loader empties the massage drum. The massage drum pivots from a vertical filling position to the horizontal massaging position. After massaging, the drum returns to vertical position and can be transported to the cooling room for maturing or to a filling station. As an alternative, when placing the massage drum vertically, it is possible to remove the lid and swing the massage drum to empty the meat to into a cart. The built-in hydraulic system swivels the massage drum. Vacuum pump displacement: 883 ft3 (25 m3) per hour. Tumbler drum with wheels, shown in vertical position.